Students in Years 11 and 12 at MCSS may elect to study in the International Baccalaureate Diploma Programme. The Diploma Programme is offered on our college campus. 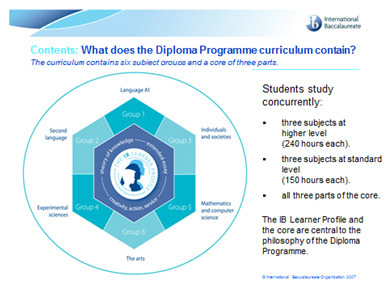 It is not required that students have studied in the IB Middle Years Programme to enrol in the IB Diploma. The diploma is an internationally recognised university entrance qualification, often gaining students early offers to Australian universities and bonus points. At MCSS, IB students study in classes alongside students studying for ACT certification. The ACT Board of Senior Secondary Studies has accredited all courses for study in ACT colleges, including IB courses, ensuring they meet the Senior Australian Curriculum requirements. Hence students studying the IB in ACT government schools receive both an ACT system ATAR and an ATAR calculated from a conversion of the IB final score. The IB Diploma Programme does require annual fees to be paid for registration and examination costs. To enrol in this course of study, please contact the International Baccalaureate Coordinator on 61420300. What does the DP Look Like for Students? Completion of the IBDP core consisting of Theory of Knowledge studied as an R unit - TOK, an action and service commitment - CAS and an extended essay in an area of personal interest or passion. Towards the end of Year 12, assessment or journals are sent to international moderators for marking. Each subject requires only 1 - 3 items of assessment to be sent so that drafting and polishing is encouraged. Examinations are conducted at the end of Year 12 in many subjects.